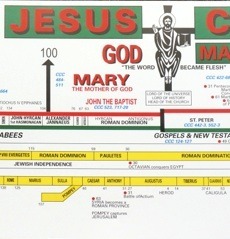 A Panorama of Creation and Salvation History Roger Nesbitt & Ian Vane This impressive and dramatic wall chart is almost 7 metres long (685cm) (over 20ft) and 21cm wide – the equivalent of 23 A4 pages laid end to end. It is suitable for any wall or walls and will make an interesting and stimulating lesson tool, drawing pupils towards studying it. A unique study aid, with teachers notes, almost 7 metres long for dramatic classroom impact. Many priests, and teachers and catechists have looked for a teaching aid, similar to the time lines used to illustrate history, which would show the work of God with unity, clarity and detail. This Panorama does just that. At a glance the events of the Bible and the life of the Church can be seen in their contemporary context. For the thoughtful student there is a need to bring together, for example the knowledge about evolution encountered in the science lessons and what is presented in the R.E. class about God’s word. The Panorama gives such a unified perspective on creation and the saving work of God. It shows how the beginning of the cosmos, through the evolution of matter, to the creation of Man as body and soul is the one same work of God which reaches it’s fulfilment in the Incarnation of God the Son, Jesus Christ, Lord of the cosmos and the centre of history (Col. 1:15). The Panorama marks the Fall of Mankind through disobedience and goes on to show the saving and redeeming work of God in his gradual self-revelation in the Old Testament and it’s completion in the cross and Resurrection of Jesus Christ. We are shown the continuity of this one work of God through the life of the Church in the Holy Spirit even to the present day. We see this most especially in the line of the successors of the Apostles, the bishops and of St Peter, the rock on whom Christ founded his Church. The Panorama looks ahead to the fulfilment of God’s Master Plan in the Second Coming of Christ. By allowing us to see secular history paralleled with salvation history as the one work of God, this Panorama is the ideal cross-curricular tool for R.E., science and history.